Quebec Railway Light & Power 124 is a third-class coach built in 1889 for the Quebec, Montmorency and Charlevoix Railway by Jackson and Sharp. Its arched roof and open stepwells speak of designs of passenger cars that were built from the 1850s to the 1870s. It originally was fitted with back-to-back longitudinal benches, then later flip-back seats along the sides. 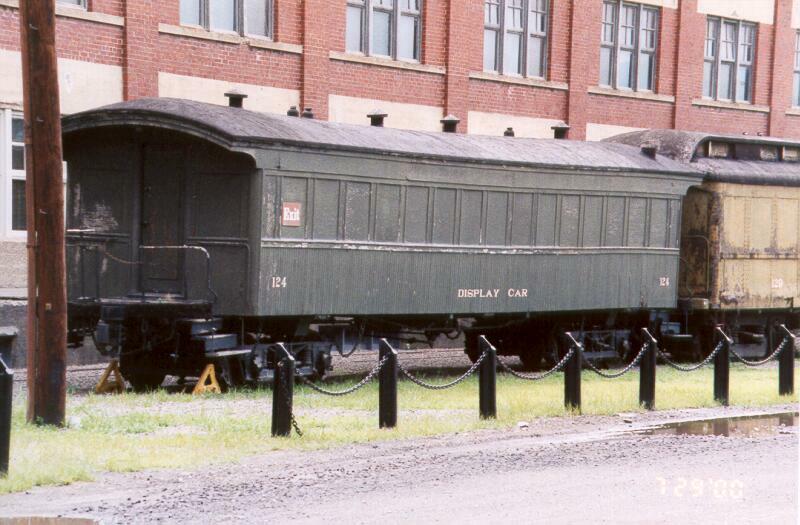 The QRL&P was an interurban line that electrified the QM&C, and the car served as a trailer behind electric cars and locomotives. It is not thought to have been fitted with MU controls. In service for Steamtown at Bellows Falls, the 124 was included in the train on the "Monadnock Steamtown and Northern" and later was a "display car" and painted as such. It made the move to Scranton. It has since become property of the West Chester (PA) Railroad Heritage Association and parts for its restoration were procured, including poplar siding material cut to length, roofing restoration material, ash interior molding, oak buffer beams and platform beams, exterior trim, etc. The car is now being advertised as available, on Railswap. Fred W. Heilich III is providing the information below regarding proposals for anyone interested in acquiring this car. Serious individuals can also receive this information, mailing address, and a photo by contacting him through Railswap. The West Chester Railroad Heritage Association will be accepting proposals from interested parties to acquire the 1889 Jackson & Sharp Quebec Railway Light & Power Coach #124, for removal in the May 2011 timeframe. All interested parties need to submit a written proposal for evaluation of the best group to receive this car. The proposal needs to include the proposed transfer of the coach from the West Chester Railroad Heritage Association, your qualifications, an outline for the future plans for the car's restoration, its storage and preservation plan, and its eventual use. A donation to the West Chester Railroad Heritage Association (a 501c3 corporation) should also be proposed to offset the expenses to date on the procurement of the all external poplar wood siding cut to size and trim, the ash interior wood trim, the two oak buffers and platform beams for both platforms, the pine step wood cut to form for both platforms, framing bolts and nuts, and the roofing restoration material, etc. that would be part of the coach acquisition. Some of the items that are in storage, but not original to the car may also be available depending on your needs. This coach is currently on live rail, but cannot be moved on the US rail system due to its age and construction. It will need to be moved by flatbed to your location as the coack on a flatcar may exceed the height requirements to getg to national rail carriers through the Philadelhia 30th St Station facilities. You would need to determine and fund the shipping and rigging costs for movement in addition to the acquisition of the coach. There are railcar movers in our area. The coach is approx 45 ft long, 10 ft wide, 13 ft from top of rail, and weights approx 47,000 lb. If you are near the West Chester, PA area, I can arrange for an examination of the car. Should you have further interest I can provide a list of materials on hand for the car's restoration. Timing will be critical for its removal from the railroad property. You should address the proposal to me and I will forward it along after my review. You should submit a hardcopy and electronic copy in Microsoft Word 1997-2003 or 2007 for review. Please address any questions you might have to me via e-mail. I hope our Canadian brethren will find a way to bring this one back home. Sounds like a lot of the work has already been done, past work specs even to the extent of materials lists and purchasing. Quite the opportunity for somebody with the capability to do the job right. Thanks for this posting on RYPN as an means of helping us at the West Chester Heritage Assoc finding a new home for this coach. We don't want to see it dismantled as there are a lot of good bones left to it and a lot of new material to help in renovating it. It's lasted 122 years. This car needs a good home. Let's hope they find one for her.